Greetings everyone!. Been a fun day around here thanks to a spontaneous decision to celebrate our 27th anniversary by hunting down some birds and sunflower fields. We were not sure if the weather was going to hold out our not as some storm clouds were rolling through the area most of the day – thankfully we didn’t get hit with the tornado swarms that were doing significant damage to our Iowa neighbors. Looks like Linda’s relatives made it through without too much trouble. We ended up making a run down to Havana IL so I could get a nice bird in the tin (looking forward to getting that posted here) and Linda was definitely able to add to her flower portfolio form the two sunflower fields we successfully located. Those were both still in their bloom stages where the fields down the road from us have officially wilted. Tired from the long day, so opted to rest a bit and push out a post. For ease, going back to our recent trip to the Texas Gulf Coast for this post. A lot of those pictures were processed already and easy to simply pull them into a new post. I find the largest chunk of time in any of my posts is getting the pictures in a shape I’m willing to share, so having that part out the way is a huge benefit when you have a short time to get one of these out. 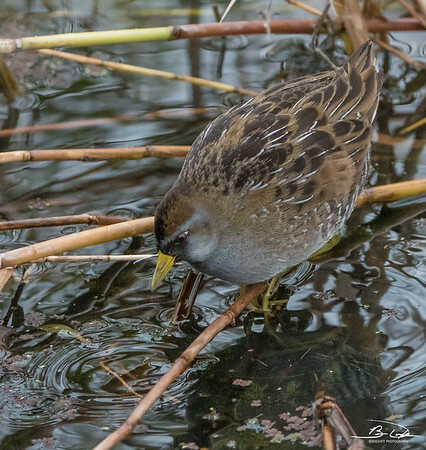 Today’s featured post is our friend the Sora. 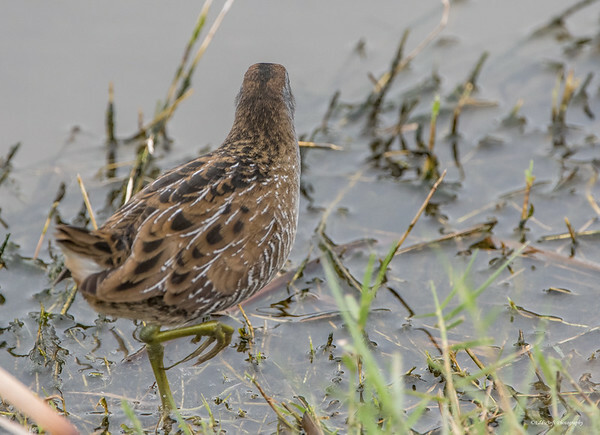 Like the last post, the Sora is not a new bird to the blog. That previous posting (link here) featured a specimen found down at Emiquon National Wildlife Refuge. We ended up swinging through there today on our way to Havana. Unfortunately, the dry summer has really impacted that place. For those familiar with it, the water has receded way beyond the observation decks at the back of the refuge. Hit the jump to read more about my encounters with the Sora. Our specimens today come from locations where there was plenty of water. This first set was taken while visiting Anahuac National Wildlife Refuge last December. We were driving around the auto-loop and came to the boardwalk on the back of the ponds that take you out through the reeds. 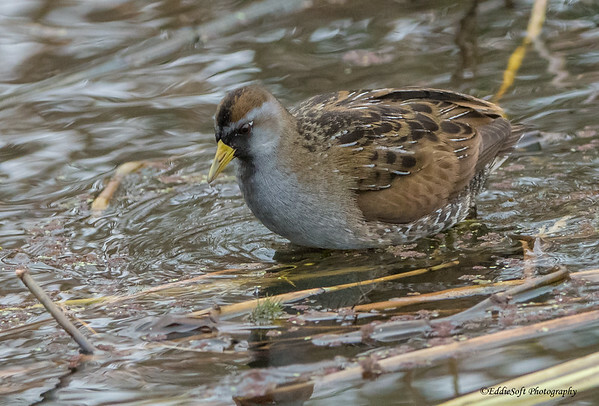 On my way back from an unfruitful walk, this Sora popped out on the pond’s edge. Probably spent 20 minute shooting this bird only to find out on my way back to the car I had my shooting settings wrong. I had rented a new camera body for the trip to test it out – was thinking about upgrading my rig and wanted to see how it did in the field before plunking down some serious change. I shoot in RAW (as I hope all of you do), but my camera slots were set to JPEG – CRAP! Remember complaining to Linda and getting ZERO sympathy. She had a point – no excuse for going into the field unprepared – sigh. The settings were fixed and resigned myself to a whole bunch of images that couldn’t be processed much. 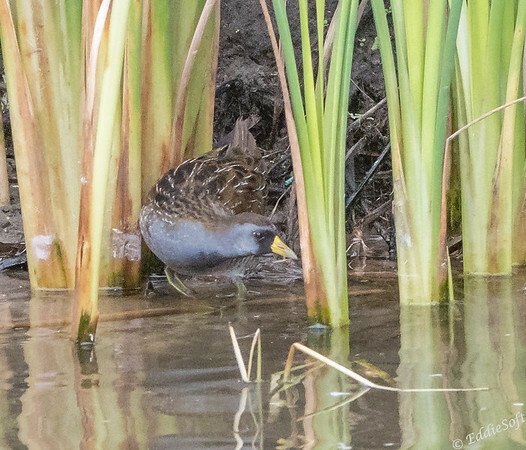 A quick glance back at the pond edge brought a huuuuuge relief – the Sora had clearly noticed my distress and graciously came back to model again! 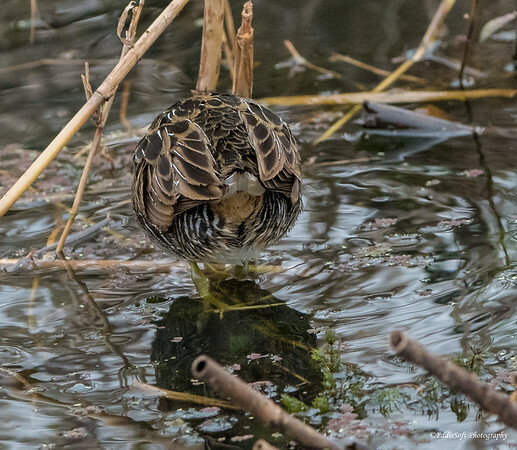 20 minutes later, the Sora was back in the tin, this time in RAW format. There are a few shots of other birds that were taken with the incorrect settings. Those I could not reshoot. We do have some tools that will work on JPEGs, but the reduced information stored in that format prevent me from fixing my white balance (which I never worry about in the field) and other corrections that can help mitigate less than ideal light. Not sure those differences are really noticeable in the blog format since they are reduced from the original size – my wife’s camera and the one I borrowed for the trip chew up a healthy appetite of image bits – Come print time, those become glaring flaws and a giant waste of expensive ink. That other location was South Padre Island Bird Viewing and Nature Center. Yes, one of my favorite places to bird! 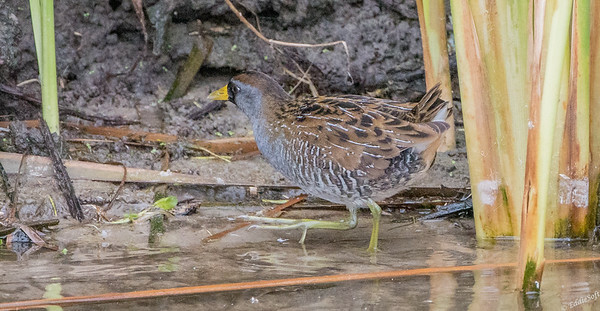 Minutes before spotting the Rail Clapper (link here), this Sora popped out of the reeds for a brief exploration. This left me with time to get about 5 shots in the tin – 2 of which stayed on the floor of the digital dark room. This one was slightly smaller than the Anahuac specimen – maybe younger or possible the female. The adult males and females look similar, but the Juvenile is more brown and doesn’t seem to have as yellow a bill – based on that, I should take back one of my earlier possibilities. To its credit, staying in those waters was a bit dangerous. There was an Alligator hanging out in that area of the marsh (see the write-up about the Clapper) and of course, the Clapper itself towers over this species. These Soras range in the 8-10 inch length where the Clapper comes in at the 13 to 16 range – also has it by at least 10 ounces. Not aware if these two Rail family members get along or not. For peace of mind, let’s assume they went to the Padre Island ice cream social together later that evening. Oh, before I forget, in honor of my brother Ron, wanted to make sure he had all the different angles/perspectives. That’s about all I have for you today. Been a busy day and looking like it’s going to be a double run weekend – heat wave snapped and were down in the high 70’s. When the mercury dips that low in the Midwest summer you do not miss an opportunity to get a few more miles in your running shoes. With that, I bring you “the end”. Again, just for Ron hehehehehe. Take it easy everyone, be safe out there! Thank you – guessing you are talking about the 4th picture? I’ll reach out directly. That’s a species I’m familiar with, managed to twitch one here in the UK a few years back, though it took two 270mile round trips to get a decent view to tick it off my list! As for camera gaffs, I was out shooting butterflies one day and had by accident knocked the dial to full manual from aperture priority. Good job I checked the images, and my subjects were still around. Now that is committing to the tick! Fortunately, my initial tick only only took about an 1.5 hrs of travel to get in the tin – now these shots were quite a bit further – no complaints though as it took my out of the -21F weather (without windchill) here in the heart of the US to what felt like a balmy 45F on our southern tip – we were ecstatic, but the locals were bundled up in ten layers of clothing. Looks like you lucked out on your gaff – I’ve made a little list and put it in my camera bag as a reminder – 1) load full battery, b) format cards, c) Set dial to U1 or U2 (I rely on the quick user settings to swap between birds on wire to birds on move and finally d) check foreground – working with big glass I often forget the weeds in front of the camera can be hidden. Saved me more than once, although still screwed up the capture setting. I have to laugh a bit on this being that my wife could have used a quick reminder list on our recent trip to Arkansas – she forgot all her filters she needs for her waterfalls – ended up driving 5 hrs out of our way to acquire new ones – sigh. 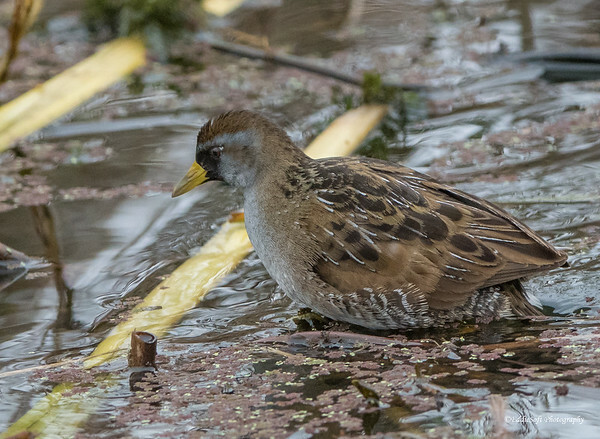 Thanks for stopping by, really appreciate it – will have to go see if you posted your Sora find. The Sora was before blogging and bird photography, like a lot of other cracking rarities.